Sony Online Entertainment wants to push you into a life of crime. Though I'm sure there's a joke about the state of the PlayStation Network in there somewhere, I am referring instead to the company's newly-announced shooter Payday: The Heist. In short, Payday is an attempt by SOE and developer Overkill Software to recreate the best Hollywood heist films in squad-based shooter form. As the official press release puts it, Payday is "a high-intensity squad-based first person shooter where players take on the role of a hardened career criminal pulling death-defying heists in the never-ending pursuit of the next big score." Six High-Intensity Heists: Whether you're blowing the roof off a building to extract a safe via helicopter or emptying the vault at the First World Bank, these action-packed heists will have players on edge and always checking their six. Interactive Co-op Gameplay: Whether AI or live, your crew of four must operate as one to bring get the "big score." Sharing extra ammo and med kits, helping regen wounded partners, guarding key positions, taking civilian hostages or cracking through various security measures - it's all for one and one for all. Endless Replayability: Dynamic environments, adaptive enemy behavior, shifting entry points, FBI agents repelling down on ropes through the skylights, SWAT teams crashing through the windows and special units crawling through the ventilation shafts makes each play-through of every heist a unique fight. Massive Character Progression Tree: Players choose a specialty - assault, sharpshooter or support - to gain weapons and equipment that fit their preferred form of violence. Unlock trip mines, silenced pistols, machine guns and much, much more. Shout Out Button: Players need to be vocal and shout commands and directions to the co-op crew, as well as hostages and the police if they want to survive to spend their cut of the take. Hostage Trading: Hostages can be a lifeline. If anyone in the crew is taken into custody, trade hostages to get crew members back and increase the odds of completing your objectives. PlayStation or PC: For keyboard and mouse marksman, as well as handheld controller snipers, PAYDAY is the uber-FPS for a high intensity shooter fix. More DLC: Additional heists, weapons and equipment means PAYDAY - a digitally distributed AAA quality title for less than half the price of a retail game - is total OVERKILL. Well there you have it. 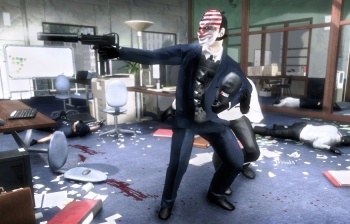 Payday "is the uber-FPS for a high intensity shooter fix." How can you argue with that? In all seriousness, the most intriguing bit of this entire announcement is in the masks worn by the criminals. That "patriotic clown" look is a bit tired, but a Ronald Reagan mask would be totally boss. So far the game lacks a solid release date, though SOE's press blast promises the title will be on shelves later this year.